Simple Undersink Filters come with no installation hardware, and are intended to filter all the cold water that comes through the regular sink faucet. Do not install on a hot water line. We recommend simply replacing the cold water supply line with two flexible supply lines that allow the cold water to be routed through the filter and returned to the faucet. Since there are a variety of possible undersink setups, it's easiest for the installer to obtain hardware store parts to adapt to the specific situation. 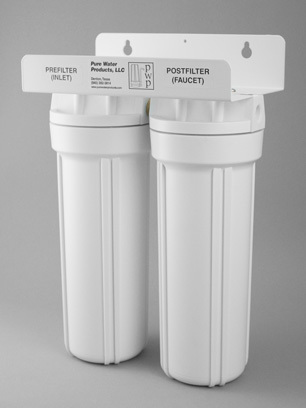 Standard ports are 3/8" pipe thread, compatible with most undersink plumbing. Connectors and elbows with 3/8" MIP x 3/8" compression threading are recommended for connecting to 3/8" braided stainless steel flexible lines. Flat-bottomed units usually have 1/4" ports. Bracket mounted units can stand freely or be hung on the undersink wall using two standard screws. Flat-bottomed units are designed to stand on the floor in any convenient location. We stock a variety of fittings and flexible lines, including quick connect fittings that allow plastic tubing to be easily installed on the filter. Give us a call if you can't find a needed part at your local hardware store.